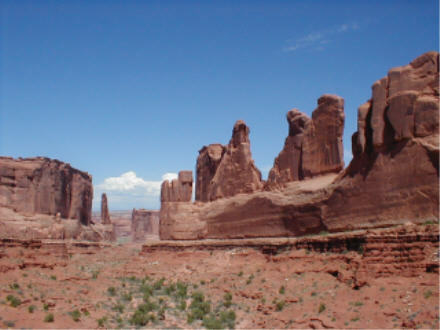 The world's largest concentration of sandstone arches, with other spectacular formations. 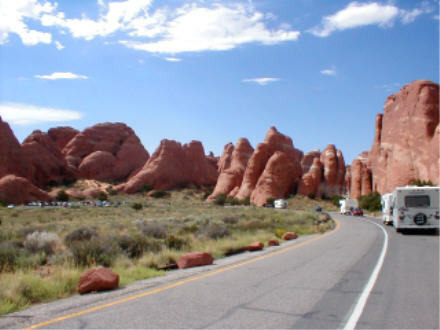 Arches National Park is well suited for both roadside sightseeing and day hiking: a 20-mile (one way) park road leads past four groups of features, while numerous trails branch off the road to provide access to the major arches. 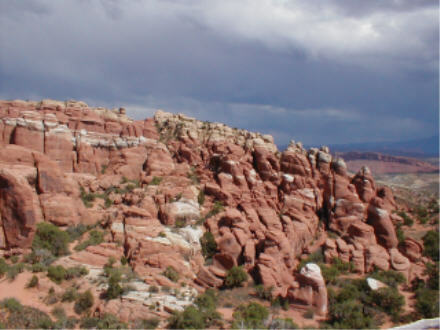 Allow a full day for a thorough visit with little hiking, or 2-3 hours for a short spin to the Windows Section. Bring plenty of water, though: summertime temperatures often top 100 degrees. 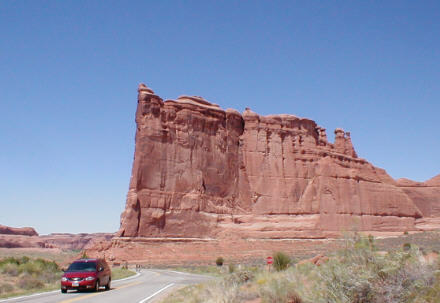 Once past the Visitor Center, one first encounters the "skyline" of Park Avenue and the Courthouse Towers, eroded spires hundreds of feet above the road. 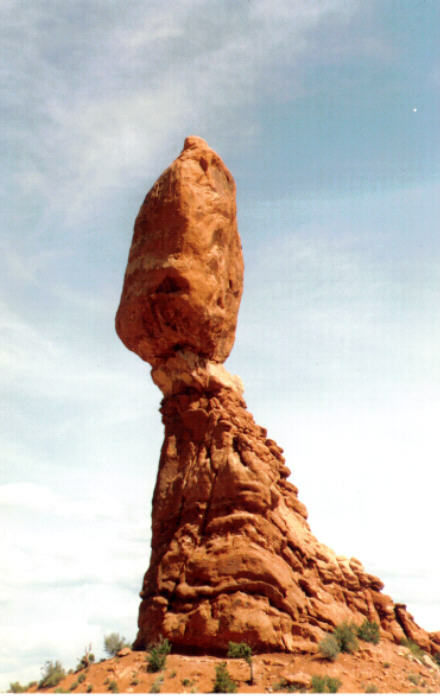 Five miles ahead stands the amazing Balanced Rock, a 55' boulder teetering atop a 75' pedestal. 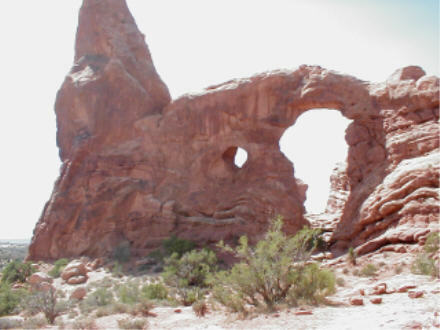 Turn right here for the Windows Section: eight immense arches visible (and hikable) from the parking lot turnaround. 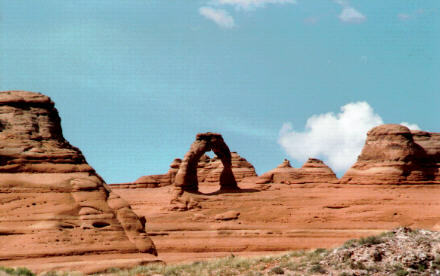 Back on the main road, continue 2-1/2 miles, then turn right on a good dirt road toward beautiful Delicate Arch. 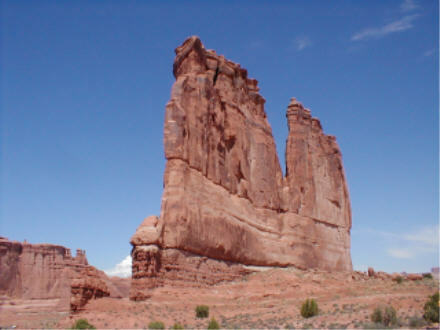 Originally called "Schoolmarm's Bloomers," this 45' high arch has graced Utah's license plates and the covers of many Utah travel guides. 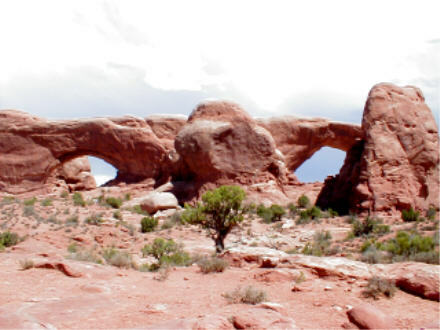 The last major collection of arches, Devils Garden, lies ahead, at the end of the road. 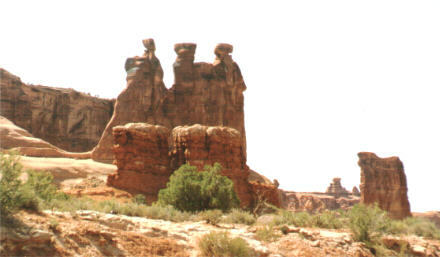 The canyon leading into the Garden contains some of the park's best hiking. 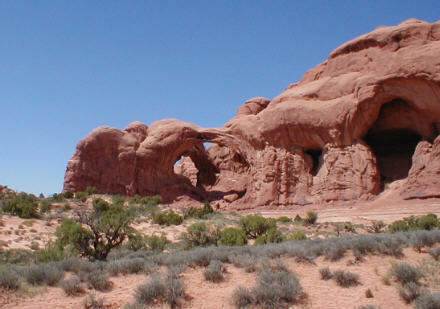 Halfway down the two-mile Devils Garden Trail stands Landscape Arch, at 306 feet the world's largest.